Cycling along the banks of the Rhine on a hot afternoon we were enjoying the breeze that is the reward for pulling on your lycra shorts and manhandling the bikes off the back of the van in 30c heat. The Rhine has safe cycle tracks right along its banks and, being beside a river, they are generally flat. The easy nature of the ride attracts a full range of cyclists, from those who haven’t been on a bike in years to fully equipped and speedy endurance cyclists. Fortunately the tracks are wide enough for everyone, including the hikers that stride along, sometimes with big rucksacks and heavy boots on board. The only problem with the self propelled bike method of producing a cool breeze is that as soon as you stop the sweat starts to gush from every available pore. We made the mistake of stopping to take a photo and then we were blinded – now we understand those strange sweat band things that proper cyclists wear. Pedalling back along the bank we flashed past the strangest thing I’ve ever seen on two bikes. A couple had stopped mid cycle, grabbed hold of one another and started snogging in a ‘quick get a room’ kind of way. For several hundred yards as we approached my brain tried to make sense of this four wheeled, four legged, double giant headed object standing still on the path. They must have been overtaken by lust – didn’t even take their bike helmets and glasses off. This is the cyclist’s version of not taking your socks off to make love. A romantic faux pas if ever I saw one. We were in Bacharach, about four miles south of Oberwesel, one of the places that hosts the Rhine in Flames. This huge event is part of the wine festival and includes fireworks that light up the river. We tried to get a spot on the Stellplatz in Oberwesel but there was no chance. Motorhomes were lined up on a side road, bumper to bumper right beside the main road in the heat. The decision to drive on to Bacharach was an easy one. On the Stellplatz here we found several other British vans and friendly neighbours who had already sussed out the best way to get to Oberwesel for the festivities. This is one of the real joys of travelling – meeting friendly people and sharing tips and ideas. More on the Rhine in Flames event later. Bacharach is an ancient little town with cobbled streets, a few shops and the inevitable beer gardens. It is very pretty and is a magnet for tourists. This was an obvious spot to continue our classification of Tourist Information advisors. The advisor was busy when we went in, speaking in German to a couple who clearly weren’t getting the answer they needed. As they left she turned to us and asked, in good English, “Is there anything you want because I’m closing” and handed us a town map. We asked what time the fireworks would start, she said “Nine o clock” and hustled us out of the door. Andernach – truly excellent. Very helpful, informative, good coffee, air conditioning and free wifi. Thank you Andernach. Our friendly fellow travellers, Brie, Terry, Sue and Eddie, helped us source our rail tickets for the wine festival and incredible firework display that is The Rhine in Flames. We opted to take the dogs with us, as the heat in the van has been unbearable and we couldn’t consider leaving them for the evening. We got on a crowded train in Bacharach for the short, one stop ride to Oberwesel where we were flung out into a heaving mass of humanity all headed towards the wine festival and the riverbank. We were hungry and thirsty but with two dogs, a rucksack and crowds of people to negotiate we couldn’t for the life of us work out how to put these things to rights. Finally we found a park bench at the gates to the wine festival street and Shirley fought her way back through the crowds to buy sausages in buns and chips. We devoured them gratefully then found our way to another park bench by the river, bought some water and settled down to wait for the fireworks. Crowds were gathering from 7.30p.m. even though the fireworks weren’t due to start for another two hours, so we felt lucky to find something to sit on. Everyone round us was drinking wine and beer but in the end we decided to have an ice cream and stay sober. I fought my way back through the crowds to find an Italian ice cream shop where the man serving the ice cream was clearly stressed and exhausted. When I tried to make myself understood he put his head in his hands and muttered “Mein Gott!” then spoke English to me. I tried to smile winningly at him but he wasn’t in the mood, he took my money, thrust two ice creams at me and grunted. Taking the dogs was both a blessing and a mistake. Before the fireworks started they attracted lots of attention and several people chatted to us, some in English, some in German. 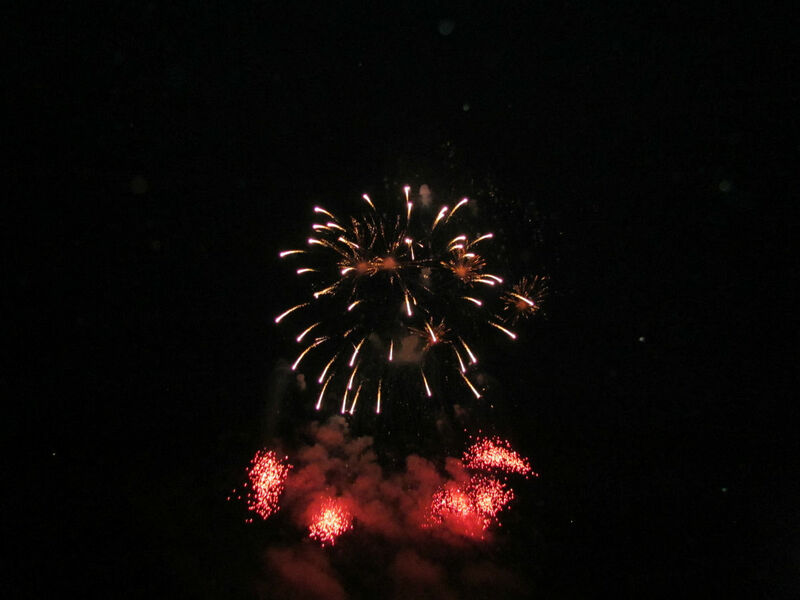 Once the fireworks began the dogs were terrified and cowered pitifully, shaking and whimpering. They’ve never been afraid of fireworks before but these were in a class of their own. They were by far the most spectacular we’ve ever seen and therefore of course the loudest and brightest. Walking back to the train after the display they were back to normal and Poppy enjoyed a late, illicit, supper of discarded sausages. The Rhine in Flames is wonderful and well worth the effort to see it. Its popularity means that you have to be prepared to stay in cramped surroundings as the whole world and its mother turns up too. The Stellplatz at Bacharach was packed tight, there was very little shade and we had to contend with other people’s cigarette smoke coming in through our windows and the inevitable sound of bodily noises coming from the van parked right next to ours. Worse by far, in a packed space in the heat was that the van next door to us had a SOG fitted. If you’re not a motorhomer you might not know what a SOG is, so here’s a quick explanation. Instead of using toilet fluid that deodorises and disinfects the contents of the toilet, some people have a fan fitted to their toilets that prevents the smells coming back into the van. Unfortunately what that means is that the smells come out into the atmosphere around the van. If you’re parked up within six feet of one and all your windows are open it is pretty unpleasant. Many people swear by their SOG and talk lovingly of it in a similar way that others speak of their dishwasher or tumble dryer. I hate them – even more so now that we’ve spent two nights in the heat parked next to one. Leaving the Stellplatz in Bacharach we wandered south, desperate for a quiet spot with some grass to sit on and a bit of space. We’ve had 10 nights on Stellplatz and have proved without doubt the truth of the saying ‘you get what you pay for’. A couple we met on the ferry recommended Rüdesheim am Rhein so we took a spur of the moment decision to head there and see what we could find. Looking up Rüdesheim on the sat nav we were off! Sadly we landed up in a small town called Rüdesheim that wasn’t on the Rhine at all! Future visitors be warned, Rüdesheim am Rhein is a completely different place. There are 15 miles and a ferry ride between the two. For any Scots readers, consider the difference between East Kilbride and West Kilbride and you’ll get the idea. After crossing the Rhine on a ferry we found ourselves in the right place and very attractive it is too. Pretty soon we came across a lovely campsite beside the river, saw an open air pool and checked in. It’s expensive – 32€ a night – but it is so worth it. The showers and toilets are like a 4* hotel, we’ve got space under a big tree and all is well with the world. Well almost … after we arrived we noticed a big top in the field next door and an hour later the music started. Circus anyone? Thanks to Mr Google I now know exactly what a SOG is. I couldn’t resist looking it up! Thank you Both. Iv’e just caught up with your travels. My son has married a girl from Rudesheim and got married in a lovely little chapel in the forest near by. Amazing connection Chris. As I write this we’re at the top of a hill looking over the town. Beautiful!